Cette petite cabane rustique dispose d'une cuisinière à gaz, d'un réfrigérateur, d'un lavabo et d'une pièce de préparation de repas. Son coin salon dispose d'un canapé futon (lit double), d'un petit moniteur avec lecteur DVD et radio et ventilateur de plafond. La chambre a un lit double, deux coffres et un placard pour le stockage et le ventilateur de plafond. La salle de bain a une baignoire / douche, un lavabo et des toilettes, des serviettes et des draps fournis. Véranda spacieuse avec un canapé-lit queen size et des chaises confortables pour se détendre, donne sur le lac avec quai et zone de baignade. Immergez-vous dans cette retraite paisible ou visitez l'une des petites villes proches pour la crème glacée, les magasins ou un repas. Walk-in zone de baignade, 3 kayaks, pêche, sentiers de randonnée, cueillette saisonnière de petits fruits et excursions d'une journée sont toutes des options pratiques de ce havre boisé. L'eau embouteillée est recommandée et certains seront disponibles lorsque vous arrivez. Peaceful....sincere consideration for our comfort...very amiable neighbors. My husband and I stayed at this very immaculate, cozy, rustic cabin for 5 days last week of september. Weather wasn't on our side ...rain for 2 days and chilly...but this cabin was warm (2 wall heaters that work great) and full of alternate entertainment. TV with DVD and VCR....a great library of both. Books and games. WIFI was wonderful. Wood stacked by the fire grill. We had two dogs with us and they were happy too. Just love the small cabin nooks and craneys used so effiecently and full of antiquities. Had everything we needed...right down to towels, bedding, blankets etc. Great large screened in porch overlooking the lake. Your comfort and needs are Steve and Donnas main concern. Thanks for your review of our property, we're glad you enjoyed your stay. It was our pleasure to have the both of you stay at the cabin, and we hope to see you again in the future. Pet the puppies for us. This cabin has everything you need to be comfortable. The lake is beautiful and great for water sports. The owners are attentive and accommodating. We had a nice relaxing stay. It was quiet, clean and well stocked. Steve and Donna were wonderful hosts who made us feel at home. Our eight days at the cabin were filled with kayaking, swimming and exploring. We made good use of the Maine Map Guide provided in the cabin. We especially enjoyed meeting the locals at the Saturday breakfast at the Mt. Vernon Church. We also had some great meals on the patio at the Sunset Grill in Belgrade Lakes. Not to mention the great photo ops at every turn. The hiking was fun and we enjoyed the humorous artwork left by young adults on Blueberry Hill. 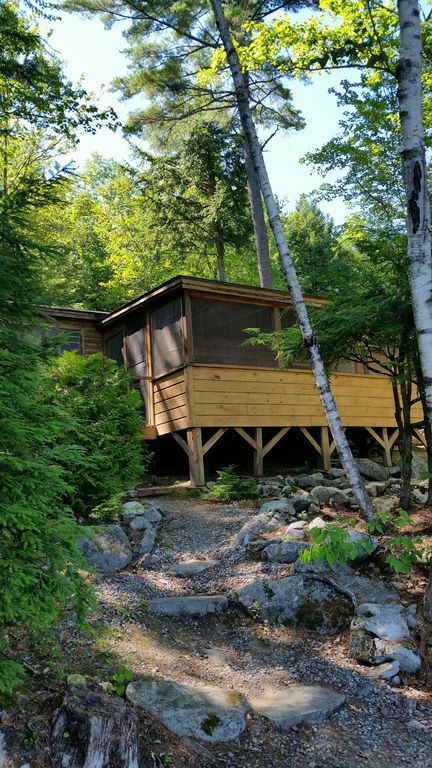 We recommend this cabin for anyone looking for peace and quiet. Donna and I want to thank you for your review, it was our pleasure to have you stay at the cabin. We're happy to hear you enjoyed not only your days at the lake, but also the other fun things to do in the area. The cabin is small and simple, but comes with everything you need down to the unbreakable wine glasses. It's a private, quiet spot on a nice lake, with loons and eagles just about the only noisy neighbors you'll have to worry about. We loved swimming and kayaking and hikes in the area. Cell reception and wifi are better than at home. We lived in the screened porch, even the sofa bed was comfortable. It all made for a perfect week in the summer. Steve and Donna are great, attentive hosts. Thanks for your review, we are both pleased that you enjoyed your stay at our cabin. It was our pleasure to have both of you spend your vacation with us on Long Pond. We hope to see you in the future. Thanks again. This was our second stay, and my son wants us to book again next year. We have no complaints. The camp is very clean, the water access is close, and the kids love the kayaks. We brought our own boat as well. The most relaxing week I've had in a very long time. Thank you to Steve and Donna; they are great hosts. Thanks for your review of our cabin, both of us are glad you enjoyed your stay this year. We look forward to seeing you guys again in the future, you are always welcome at the cabin. Enjoy the rest of your summer. My family of three spent a week at Steve and Donna's cottage in July. Long Pond is a beautiful spot and the swimming was great. The cottage itself was perfect for us - rustic, comfortable and clean with a nice big screened in porch. This is a cherished family camp that they have taken great care with. Everything was well organized and the place was spotless. We cooked all our meals during our stay either inside, or out on the grill by the water. The porch is spacious and has a pullout sofa, comfy chairs and a nice wooden table for board games or meals. We spent 1/2 our time there and the rest of the time either in or by the water. My sister and her partner and their two pugs visited us for one overnight and we did not feel crowded. Steve and Donna were welcoming, kind, and accommodating -- really lovely people. Our 12 year old was comfortable on the futon inside, and was in and out of the water all day. There were three available kayaks and lots of places to explore around the shoreline, and it was fun to watch for the eagle family nesting on the island directly across from the camp. We miss it already and are looking forward to hopefully coming back next year!